Philip D. Wagoner may have built one of the largest mansions in town, but the man who produced millions of typewriters and was a pioneer in making digital computers, spent most of his Ridgefield years living in his own caretaker’s cottage. 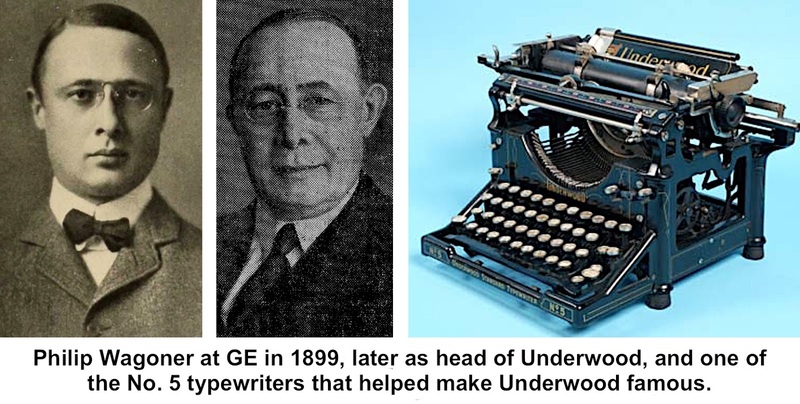 Wagoner came to Ridgefield around 1932, when he was head of a group of companies that included Underwood Typewriter. He acquired a spread on West Mountain on the shore of Round Pond that included a residence and a large icehouse used to store ice cakes in the days before the electric refrigerators. Wagoner tore down both the house and ice house and built a large — some said “pretentious” — two-story mansion that was reputed to have cost about $100,000 at that time ($1.4 million in 2016 dollars). The stone facing on the house and entrance gates was imported from France. He called the estate “Oreneca,” after one of the American Indians who sold Ridgefield to the first settlers. In 1940, about seven years after Philip and Effie Wagoner moved into their new house, Effie died at the age of 64. “Although he recovered from the shock of this loss, it broke his spirit, which had led him to erect his great home here, and thereafter he spent the major part of his Ridgefield days in the seven-room foreman’s house on the property, which was a replica of the larger 27-room mansion,” wrote Karl S. Nash, former editor and publisher of The Ridgefield Press. Born in 1876 in Somerville, N.J., Philip Dakin Wagoner came from a family that were among the settlers of Staten Island, N.Y. He graduated in 1896 from Stevens Institute of Technology; his thesis was typewritten, which was very unusual at the time, according the Journal of Business Education. Perhaps it presaged his future career. products — airplane engines and artillery casings. In 1918 he became president of the Elliott-Fisher Company which soon merged with several firms, including the Underwood Typewriter Company, eventually operating under the name of Underwood Corporation. 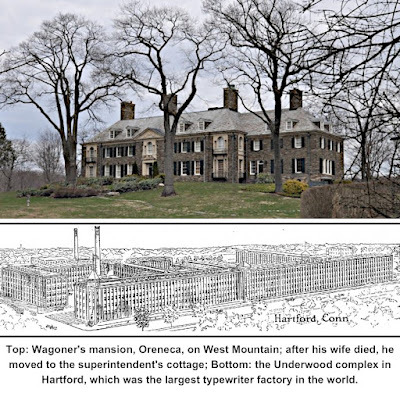 Under Wagoner’s command, Underwood operated the largest typewriter factory in the world, located in Hartford. The plant could turn out a typewriter a minute. His favorite motto, “It Can Be Done,” was proven during World War II when Wagoner led the conversion of that huge typewriter factory into one that produced M1 carbines for the military. help businesses with functions like accounting and payroll. He established the Underwood Computing Machine Company in the late 1920s, making mechanical calculating machines. 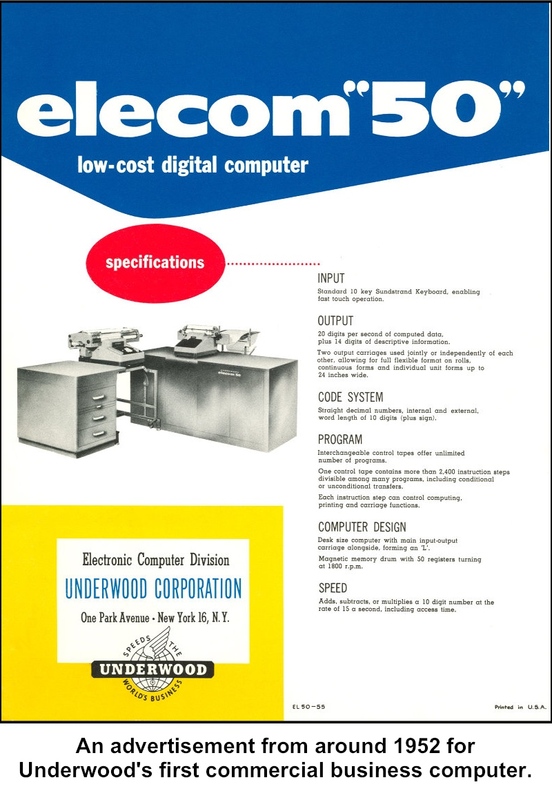 By the early 1950s, Underwood had acquired the business of the Electronic Computer Corporation, and began manufacturing digital computers under the trademark, Elecom. 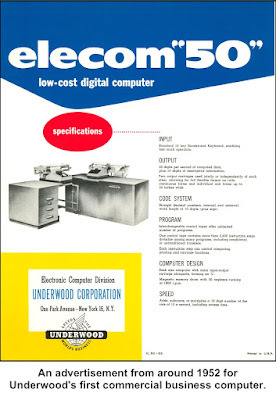 Its “low-cost digital computer” in 1952 consisted of two sizable desk units with an output of “20 digits per second of computed data plus 14 digits of descriptive information.” This machine weighed 750 pounds, had 160 vacuum tubes, required two kilowatts of power, and cost $17,000 ($153,000 today). Its “average error free running period” was six hours. At digital computers, Underwood lost out to International Business Machines and others, whose desktop computers eventually helped spell the end of the typewriter, too. The last Underwoods were made in the 1980s, after the company merged with Olivetti, another typewriter manufacturer. Wagoner retired in 1956 after 60 years in the business world and died in 1962 at the age of 86, still maintaining his chief residence in Ridgefield. Oreneca later became the home of Harrison and Jean Horblit, whose profiles also appear here.